Are you looking for a bartending school that is near? The Professional Bartending School is near and easily accessible to everyone in MD, VA, and DC. 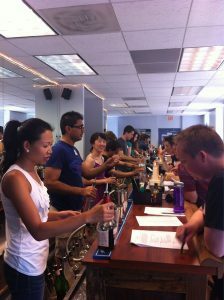 The Professional Bartending School is located near everyone in the DC region. We are literally in the center of the greater Washington DC area. We are 2 blocks from the Orange/Silver Line Metro Stop at Courthouse in Arlington. That is 1 mile outside of Washington DC and easily accessible to anyone working downtown or near Metro. The school has free parking on site. We have 3 different class times every week day, and 2 classes every Saturday. The school is near, accessible, and has enormous scheduling flexibility. Huge Well Known Job Placement Program. The school is among the most well known bartending schools in the entire nation and near and accessible to everyone in the DC, MD, and Northern Virginia area.